Planning an easy Easter dinner menu knowing picky eaters will be sitting at your holiday table can be tricky. These 30 Easter recipes will help you plan a festive Easter menu that everyone will love in no time at all! I have great sympathy for kids who don’t like Easter ham. Even now as an adult, I’m not a fan of a big thick slab of it on my plate. It took me a long time to realize that thinly sliced spiral-cut ham covered in a sweet pineapple-mustard glaze is actually a delicious way to celebrate Easter. But, there just would have been no convincing me of that when I was a kid. 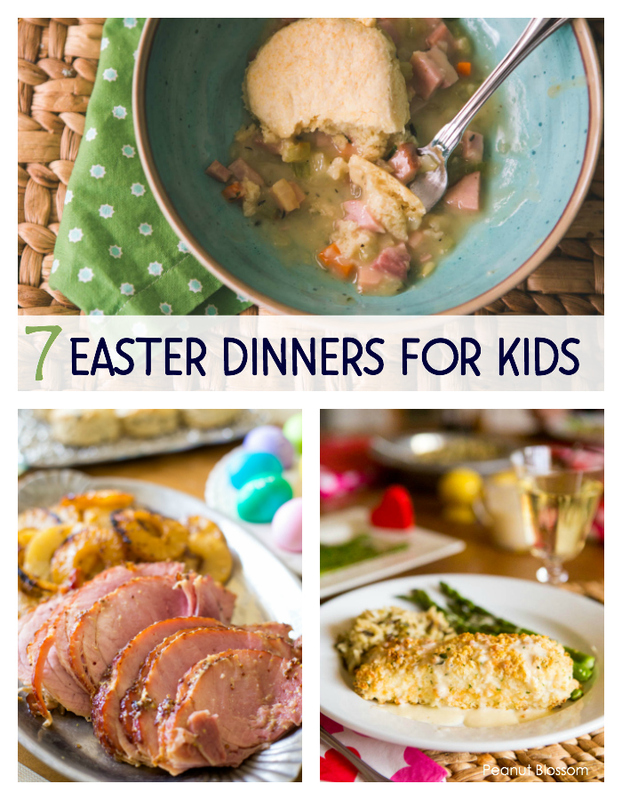 If your kid really doesn’t like Easter ham? Why not switch to a roast pork or fish? If your kid turns up their nose at potatoes? There are always hot cross biscuits or scones. If your kid groans at asparagus? You could switch to a citrus salad or roasted peppers! 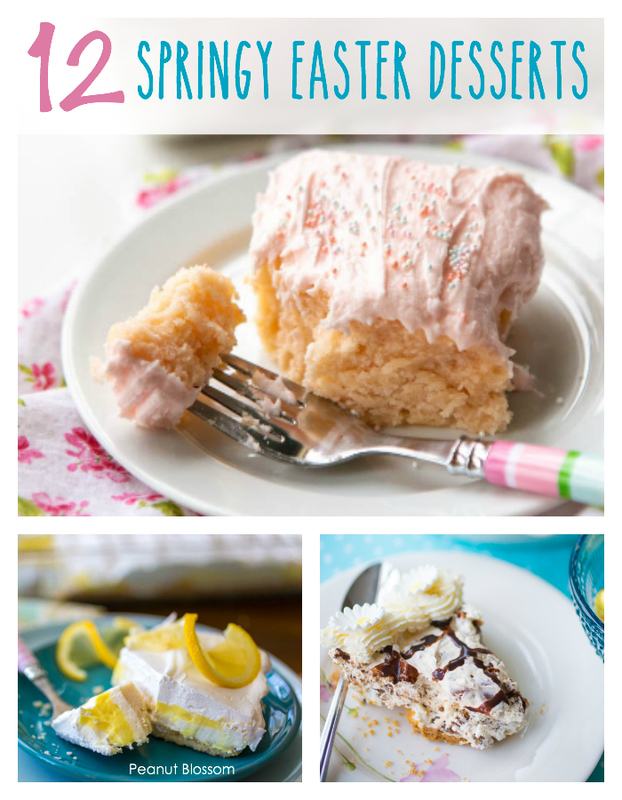 There are just so many Easter recipes for a springtime dinner menu. For our family, my husband says it’s just not Easter without the ham. And since everyone deserves to be happy, ham it is. 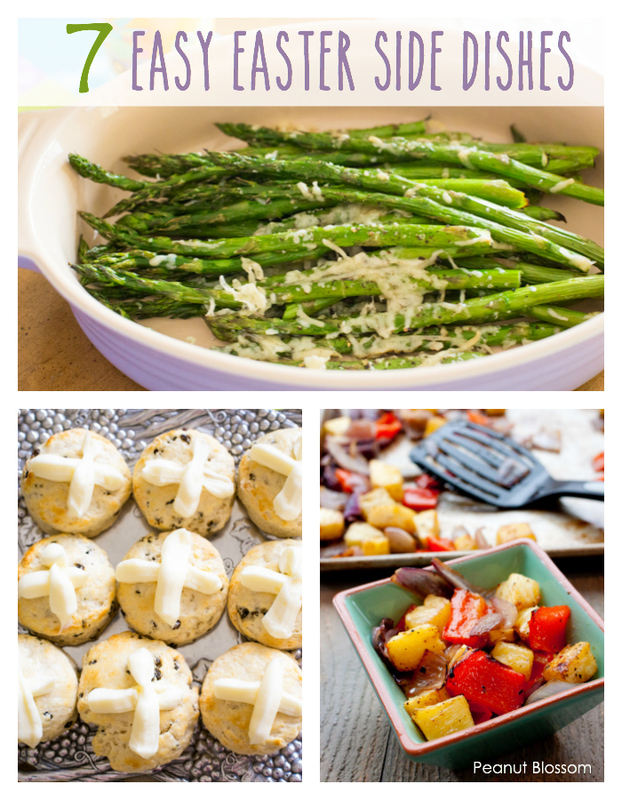 Then I just load up the Easter menu with more picky-eater-friendly side dishes the kids will actually eat. From traditional spiral-cut Easter hams to more unique macadamia crusted halibut, these elegant and easy main dishes are perfect for your Easter dinner. Pineapple ham with mustard glaze: This was the recipe that convinced me that Easter ham is delicious. The pineapples on top are everything. Gooey ham sliders: If you must have ham but your kids can’t stand the whole roast, these mini ham sliders are a fun twist on the traditional dinner. They are also great for using up leftovers of the spiral ham the next day. 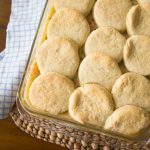 Ham pot pie with biscuit topped crust: Another great way to incorporate ham in a way that is friendly to kids–all chopped up and hidden inside a biscuit-topped pot pie. YUM. Oven roasted pork loin with green peppercorn sauce: One year we swapped the ham for Easter and made this recipe instead. It might be my favorite Easter dinner ever, but I get vetoed by my husband and mom for our ham every year since. Macadamia crusted halibut with lemon butter sauce: This recipe is SO delicious that we’ve made it for birthdays, Christmas, Valentine’s Day, and Mother’s Day. If it’s a party, you will likely find this on our table. It would be a perfect Easter recipe for anyone who doesn’t like ham. Roasted shrimp: You could make this quick and easy dish to accompany your ham for the kids or make more and feed it to the whole family with plenty of side dishes to round out the meal. If you prefer to celebrate with an early day Easter brunch, you’ll want a mix of savory Easter recipes and sweet Easter baked treats. 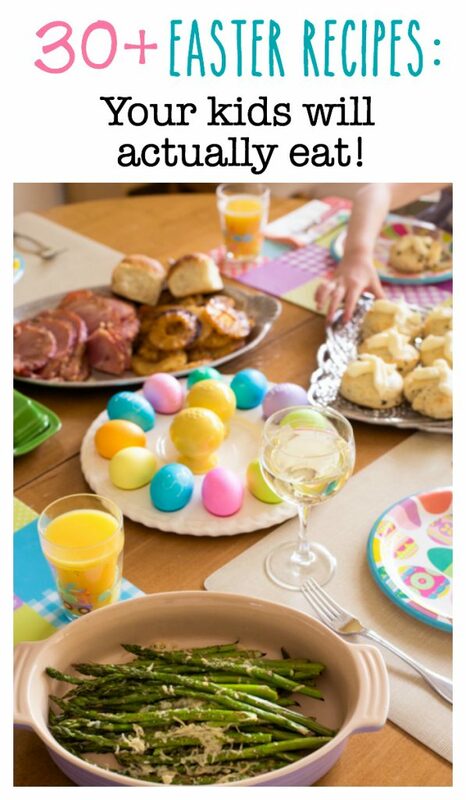 Eggs are the obvious answer but you could also add an item or two from the Easter dinners section, too! Egg and sausage casserole: This recipe is also a huge hit on Christmas morning. Sprinkle some fresh spring green onions over the top rather than swirling them into the batter if you’ve got kids who don’t like onions. Custom Easter quiche: I love quiche because you can mix and match whatever fillings your family loves most. You could add chunks of ham, sausage, cheese, peppers, broccoli, or onions. French toast with strawberry sauce: This is truly the BEST ever French toast. It’s so good, I even included the recipe in my cookbook for kids! Top it with fresh strawberry sauce and whipped cream for a very special treat. Blueberry scones: This recipe is easy enough the kids can make it all by themselves. You could swap the dried blueberries and use currants for a hot cross bun-inspired treat. Lemon poppyseed muffins: I’m a huge sucker for All Things Lemon at Easter time. These muffins would be perfect. Chocolate puffs: These bite-sized puffs taste just like chocolate croissants but are easy enough for the kids to make. They are an adorable and easy Easter brunch idea. Roasted asparagus with parmesan cheese: Both of my girls love this veggie side. It’s easy to make and perfect for most spring dinners. Hard-boiled eggs: Our Easter Bunny always hides real hardboiled eggs for the Easter egg hunt. He has since I was a little girl. I simply place a bunch of pretty ones on an egg tray for the table and it’s always a hit with the kids. Roasted pineapple and peppers: A perfect complement to the Easter ham, these roasted pineapples and peppers are sweet and tangy. Citrus salad with goat cheese and pistachios: This sunny citrus salad would be perfectly pretty on the holiday table. My kids gobbled it up when I served it this winter. If you’ve got picky eaters, you can easily serve it in deconstructed separate dishes and let them nibble on the citrus, nuts, and cheese on their own. Brown sugar roasted carrots: My kids tend to prefer carrots cold, raw, and crunchy but I think they would love this sweet brown sugar roasted version. Hot cross biscuits: Since moving to the south, I’ve become obsessed with perfect biscuits. I make these hot cross biscuits once every year for Easter and they are my favorite. The kids can’t resist the cream cheese cross on top. Cheesy potato casserole, aka “funeral potatoes”: Another dish common in both the south and the midwest were I grew up. The key to this recipe is the crispy cornflake cereal topping. My kids love the buttery crunch. Easter desserts can be tricky–the kids just got whole basket-fulls of candy! We tend to make smaller portions of dessert like a simple tart or 8×8 inch single-layer cake for the adults to enjoy. The smaller portions are great for mixing and matching a couple options if you’re hosting a huge party and want to have a fun variety on your dessert table. They are all super easy to make and many can be done ahead. Simple Lemon torte: This is one of my favorite make-ahead Easter desserts. It is so light and refreshing! Elegant lemon meringue tart: This tart takes a few more steps but is still very easy and perfect for beginner bakers. Butterfinger Pie: A HUGE hit with my kids. This creamy, crunchy, chocolate-y pie is inspired by our favorite Easter candy. Dainty carrot cake: The original version of this amazing carrot cake is a 2-layer masterpiece. It is one of our very favorite cakes so I dialed it down to make it easier (and smaller) for a smaller crowd at Easter. Strawberry lemonade cake: This is Little Pea’s favorite cake. She requested it twice last summer. It is so moist and delicious. In my opinion it is the best cold right out of the fridge. You can definitely make it the day before and just keep it chilled until serving. 7 Super-Simple Easter Treat Ideas To Bake With Kids: And if your kids really want to get in the kitchen to help, don’t miss these simple ideas for sweet Easter treats the kids will have so much fun making! If you love these holiday recipes, you really don’t want to miss these! Adorable non-candy Easter egg hunt idea that shows your DisneySide!